Jack graduated from Boston University with a Bachelor’s in Athletic Training and Doctorate in Physical Therapy. Through his athletic training background, Jack has wide experience working with Division I and III collegiate sports including hockey, soccer, lacrosse and basketball. Jack also has a vast experience with PT across the spectrum of care, from inpatient settings like the cardiothoracic ICU and stroke rehabilitation, to outpatient clinics. Jack’s areas of interest include treating running-related injuries, working with elderly patients, and educating patients to become active participants in their care. 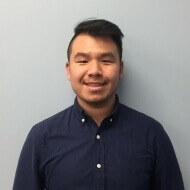 Outside of the clinic, Jack is an avid foodie who likes to cook and try different types of food and drinks. To balance this, he likes to stay active by walking/exploring the city, swimming, and playing with dogs on the sidewalk.